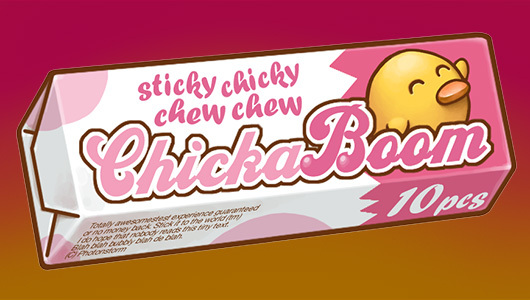 Chicks can’t get enough of the wonderful new taste of Sticky Chicky Chew Chew! But they’d better watch out for its explosive effects. 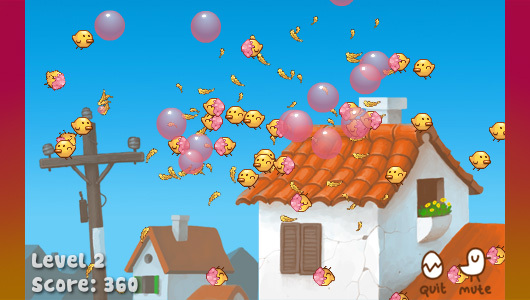 Chickaboom is a casual explosive chain reaction game with a sticky twist. 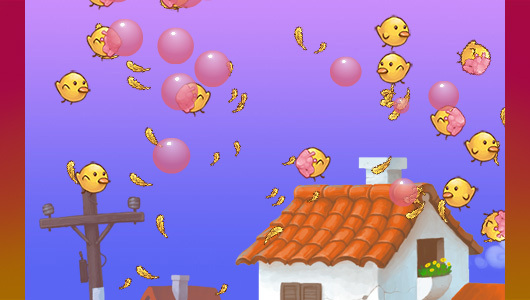 Blow bubble gum up into the sky to stick those chicks! 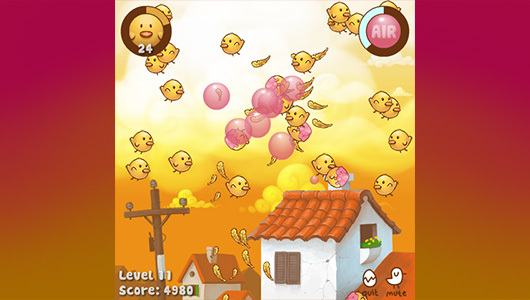 Blow little bubbles for faster movement, or large ones to clump the chicks together. 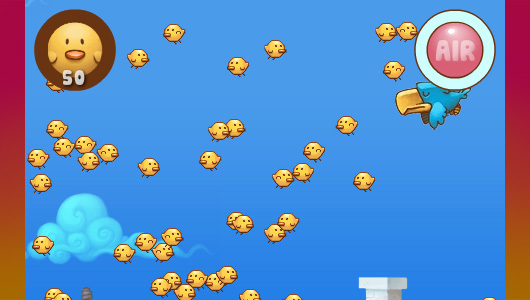 There are 20 levels of chicky action. A professionally composed original soundtrack and effects. 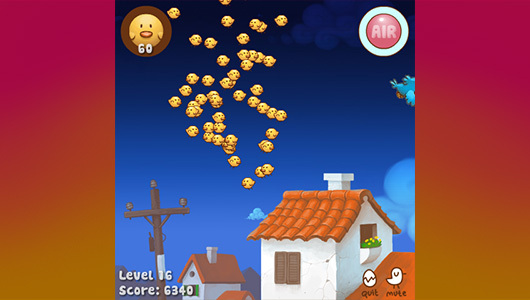 Gorgeous animated graphics and backdrops and one-click addictive gameplay. 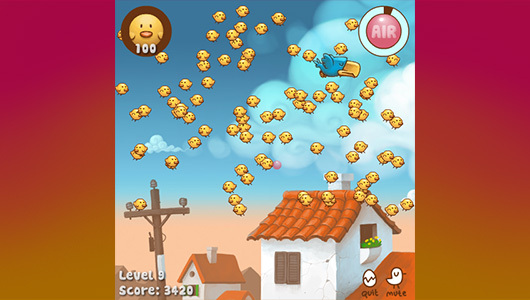 Chickaboom is the most “casual” game Ilija and I have created yet. We wanted to do something completely different to our normal pixel-art style. One day I was messing with a prototype I had made, and for fun I threw a chick sprite we had laying about into it and swapped the bubble I was using for gum. Chickaboom was born pretty much there and then. We actually started work on this game over a year ago (around August 2010) but it got side-lined as we worked on Cat Astro Phi and other projects. While digging through my source one day I realised that it was actually nearly finished, it just needed that “final push”. So we hit it hard, tweaked and tested all of the levels and out came the end result. As a game I’m extremely pleased with it. It’s aesthetically lovely, quirky enough to be different from the norm and fits into that “one-click” style of gameplay that casual games benefit from. Ideally we would have created more levels and game modes, but there’s still a good solid 20 mins worth of playtime here. The original prototype for this game involved soap bubbles in a sink / bath. 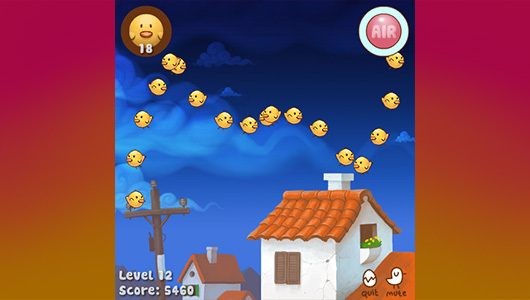 The clouds that appear in the background persist across the whole game. They start in the pre-loader, remain in the main menu, level select and through-out the whole game. I was really happy with the way they bind everything together, and the blend mode effect used on them really worked well. Ilija drew a couple of cloud types at a high res, and then they are just scaled in code randomly. I’m also super-happy with the way the sky colour changes from level to level. It’s a simple tween, but oh-so effective! 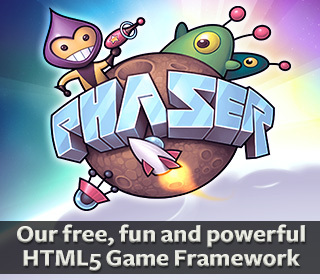 This game doesn’t use any frameworks such as Flixel, it’s just homespun AS3 code. The Flash IDE was used to package assets and audio into SWC files, but that’s all. The collision and simple physics is all basic math. Some elements (bouncing logos in, etc) are run through TweenMax as you’d expect. 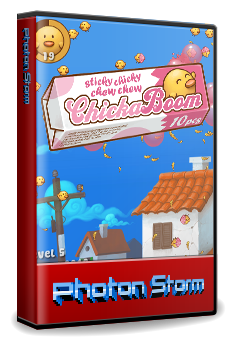 The music and all sound effects were created specifically for Chickaboom by the Symphony of Spectres. 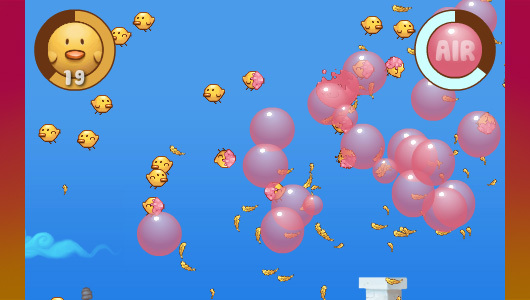 They had a playable version of the game with all the chick and gum graphics in, and we let them have free reign. We love the end result. The music is quirky and the sound effects all just fit. It’s really worth getting professional audio people to do the sound for your game. Yes it requires an initial outlay, but one that is often paid back many times over in sales. 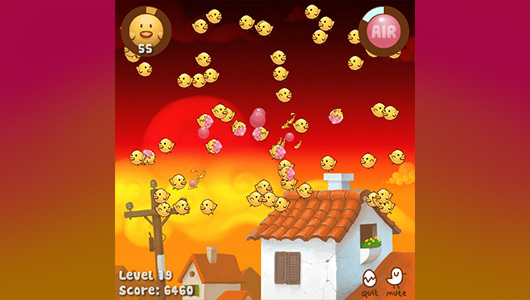 An early build of the game had 3 different game modes – 20 set levels, 20 “challenge” levels in which the chicks fly in set patterns that you need to solve, and an “air attack” mode in which you had to get as many chicks as possible with a limited amount of air (which inflates your gum). In the end we dropped these to keep things simple. 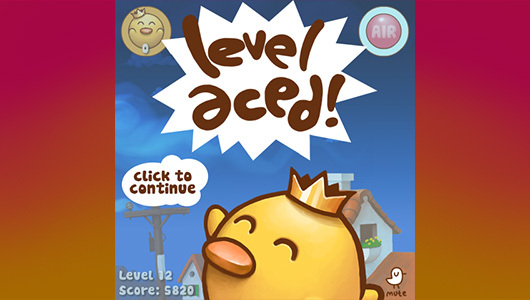 We took the best of the challenge levels and merged them with the best weighted of the normal levels, leaving us with 20 levels that offered a nice range of variety to play through – especially if you try to ace them all. The game resolution (480×480) was made with mobile in mind, but we’re so burnt out from finishing the web version I don’t imagine that will happen for a good while yet. All of the game artwork however was created at a really high resolution, should we ever want to. In total I estimate we spent approx. 6 weeks worth of development time on this game, but spread out over a very long period due to other commitments. It was one of those “hard to finish” games, where the final 5% seemed to take forever. 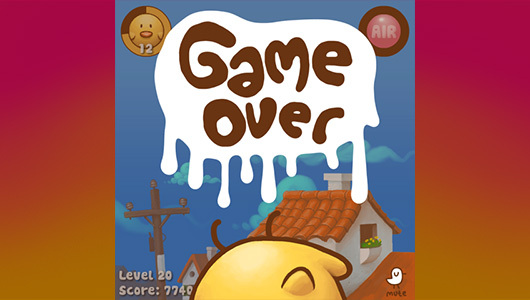 Definitely one of our harder game births to date. So you made more than $4K ? Did you get sponsor ship for per-click or you just sold it to the publisher? We made $ from selling the primary version to Spil, and then extra $ by selling site-locks to various other sites. There was no pay per-click, only really Kongregate offer that model. Thanks, what do you mean by site-locks? Like they put their preloader? Hey, I really like the music, I really use it as a ringtone if I could. 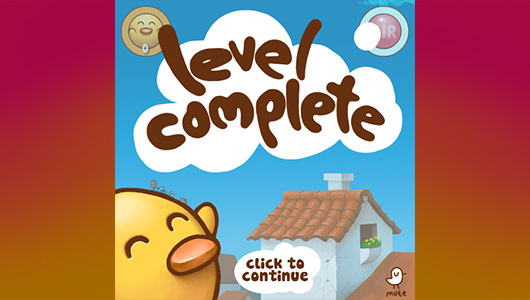 u should add more levels!!! How much did you pay for the music? If it’s not a secret? 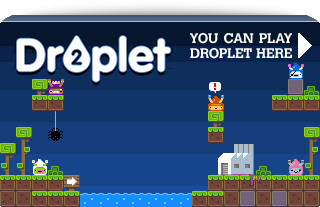 Woof, I found myself addicted to this little game. If you’re not planning on porting to iOS I really think you should! I liked that I could ace a level by making 1 click wins, although some sort of granular reward system (ie 1 to 3 stars) might make it more enjoyable for people. Also, I feel a little bad for the chicks! It’s an awsome game. Simple and addictive. 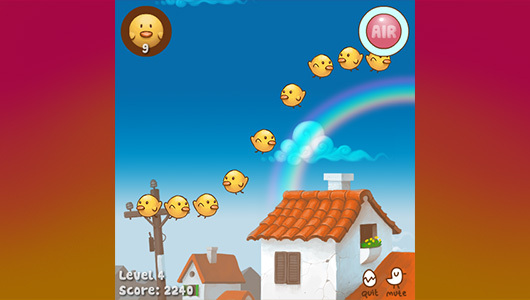 Btw, do you use vector or bitmap in the game?